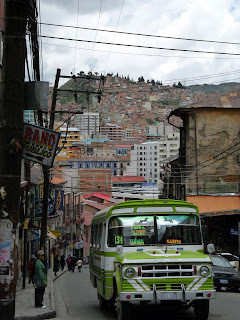 La Paz is an unforgettable sight when you first descend into it on the bus. Turn a corner and suddenly it's all spread out there below you at 3,650 metres. Like an upturned bowler hat with its centre at the bottom, the city clings to the sides of the mountains around it, branching ever upwards and out until it can climb the steep sides no more, its rim overshadowed by the great snow-capped peaks of Illimani poking through the clouds behind. I say it's like a bowler hat not just because it is, but because the women wear them here too! It's mad. Everywhere you look there are round women with long plats under bowler hats perched at odd angles on their heads. Mad angles even, just like the hats. Stan and Ollie still setting the trends for Bolivian women to follow. The traffic in this sprawling city is unbelievable. You put your life in someone else's hands everytime you cross a street, while the pavements aren't much safer. Cars honk, people shout; there's chaos and confusion all round. Somehow though, it still manages to be quieter than Perú where the only volume is deafening. 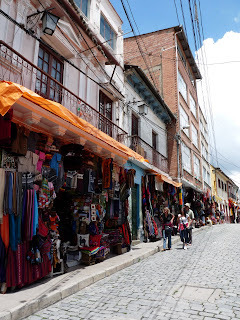 Hectic market areas are frequented by all sorts of weird and interesting people, shady characters hanging around, shoeshine boys hoping to polish up, peddlers crying and chancers trying, all drawn to Bolivia's unofficial capital with hopes of making it big or even just surviving. The poverty is tangible. 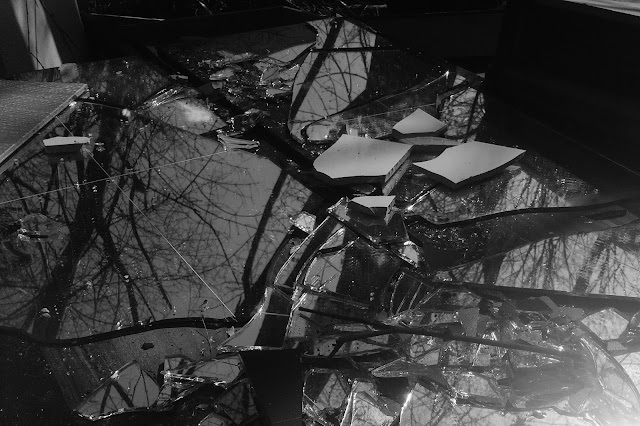 Invalids, cripples, down-and-outs, old women sitting on the pavements; their hands are drawn to us as if by magnets. The hands rise towards us everytime we pass, clutching, grabbing, desperate for something. Moaning or crying, some of them are really pitiful. It feels helping them just prolongs their pain. Kids work the streets, shining shoes or selling chewing gum - school don't put food on the table. Warnings of crime and the need for vigilance are everywhere. A policeman told us to watch our bags and pockets as soon as we arrived, before advising us to take a taxi rather than walk. Restaurants have signs advising diners to guard their bags at all times. The hostel warns of assaults and robberies and tourists, and a woman in the market told us to be extra careful with our money yesterday. Just half an hour ago a bandito managed to swipe our bus tickets to Potosí from my bag. I noticed him lurking behind before he suddenly disappeared and another tourist shouted: "Hey! He got something from your bag!" I caught up with him and managed to get the tickets back. He hadn't time to take anything else. Thankfully we won this round, and we'll still be going to Potosi this evening. Apart from more than a million people, most of them very friendly (taxi drivers and other motorists excluded of course), the city is home to 74 squillion pigeons if not more, all better fed than a lot of the people. The people actually buy them seeds and feed them in the squares, gathering huge clusters of the feckers flying and fighting around them. We actually saved one from an over-playful dog this morning. The poor old pigeon was clearly injured and in no mood to play with this big dog, but the dog kept batting him with his paw and jumping on him. The pigeon couldn't fly, but was too stupid to waddle between some railings out of paws reach. He was too stupid to even make his escape while Jenny shooed the dog away. We had to shoo him away too. I'm sure the dog just came back and gobbled him up in the end. 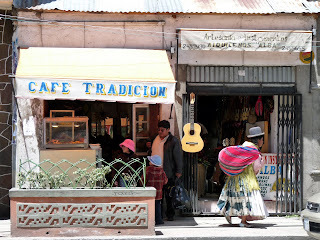 La Paz's a good place to shop, particularly if you're a witch. The witches' market is famous for its offerings of concoctions, potions and mysterious charms. 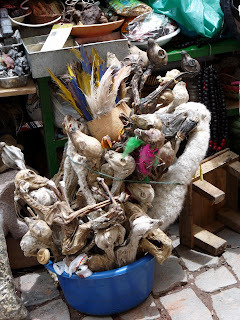 These include weird herbs and seeds, figurines and dolls, dried snakes, dried llama foetuses, stuffed armadillos and other wonderful ingredients for non-conventional cures for all sorts of ills and ailments. Some of the craziest stuff I've seen with two eyes, or even one. 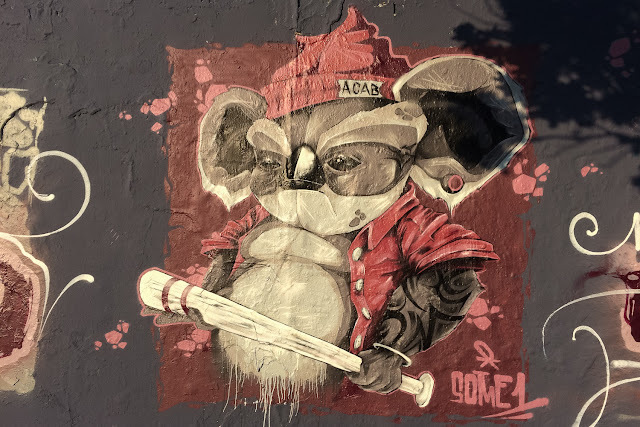 Yes, La Paz is mad. I like it.